Buon giorno. I want to give a "heads up" to people who have Websites and Weblogs. Actually, there is something useful for anyone who likes to click on links they find on other people's sites. I am probably one of the last to learn this, but perhaps this article will help someone anyway. Have you noticed an increase of visits to your Weblog in your "stats"? No, not the site counter stuff, those are somewhat reliable. I mean the strange sites, often ending in .ru, that "gave" you hundreds or thousands of referrals. I thought I had some foreigners really digging my stuff until I clicked on a few and found out that they were junk; there is no way a Russian "hot chicks" site is linking to my articles on Conservativism, Biblical Archaeology, the follies of Atheism, screen capture tools, Firefox or whatever I'm doing. No way! It was disappointing to learn that those are not real referrals, but also explains why my site counter and stats counter numbers have discrepancies in the thousands. "Referrer Spam" is a bit of a catch-all phrase. Slimeballs that want to trick search engines to increase their site's page ranking will use bots and other technical tricks. I've seen many explanations, so I'll leave you to do the work if you really want to know what they are. There are ways to stop or reduce referrer spam if you want to do some special code pasting in Wordpress (good luck with that! ), but the millions of us using Blogger.com are stuck. Do not click on the links in your stats' "referrers" list, those sites can be bad for your computer's health, capice? You don't have my skills, software or Hal the Hacker to help you like I have. Google, the owner of Blogger.com, is supposedly "working on it". Yeah, that's the same crap that Albany Medical Center uses as a euphemism for, "We're not going to do anything except watch her die, even though she was transferred here for an allegedly emergency condition". But I digress. In both cases, wait and hope for the best. Pray if you got 'em. Do not click on the links, those sites can be bad for your computer's health, capice? You don't have my skills, software or Hal the Hacker to help you like I have. Yeah, I repeated myself, Cupcake. It's important. If the writer actually puts in the link, obviously, that's a different matter. Read the "links to this site" before clicking. Skip the ones in languages you don't understand, or have unlikely subject lines. F'rinstance, if Google gets their act together and "Links to this Post" (below) begins working again, you may see something like, "Angry Blogger Rats Out Referrer Spammer" going to a valid Weblog, but if you saw, "Increase Your Income with Hot Babes", someone is spamming. My main point is use a bit of common sense; they're not all going to be bad, but some almost shout it out that they are awful stuff. For a select period of time, the "Referring Sites" were believable things. (Yes, "Thunder Pig" is a real Weblog, and written by a friend of mine.) So, I clicked on "Jeff Herring", who must like me an awful lot. Nope. Jeffie had no links to me on his site. For that matter, there were no visits referred from him in my site counter of individual hits. In my profound ignorance, I actually hit the "contact" button and sent an e-mail inquiring where he was linking to me, and what I did that he found so interesting. No reply. Also, since Google may actually be taking action on referrer spam, the "referrals" from him have dropped considerably. Finally, I attempted to visit his site on two Web proxies, and got "403" errors, but I was able to go there directly, without a proxy. 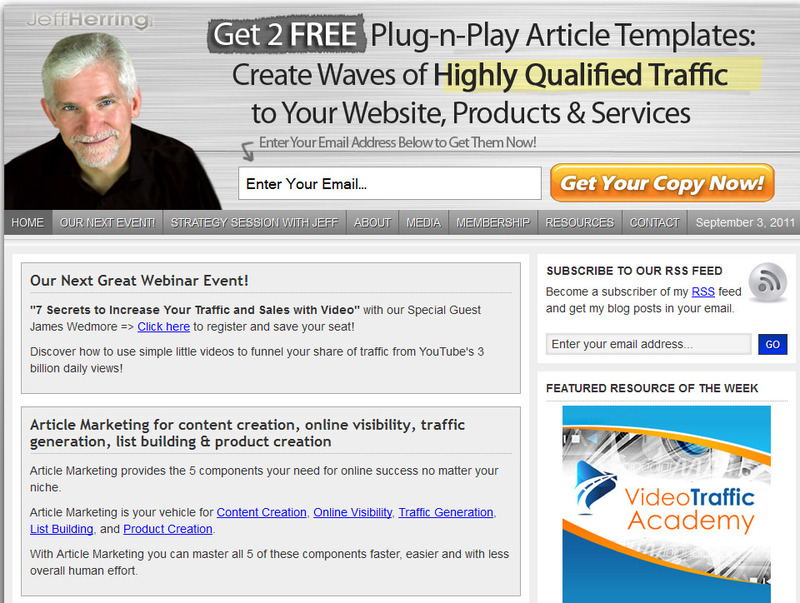 Yep, Jeff Herring makes his living by selling "articles" and tells you how to "increase your traffic". Well, well, well. I'll let you decide if the circumstantial evidence adds up to Jeff Herring being an unethical, sneaky, conniving, crafty, money-grubbing referrer spammer, or not. It's too bad his domain does not end in .ru, that would make things easier. Another Reminder that Islam is the "Religion of Peace"
Read the rest of "Two Pakistani Christians Seriously Injured for Refusing Islam" here. Buona sera. I think I'm going to post odd searches that people have used to end up on my Weblogs. 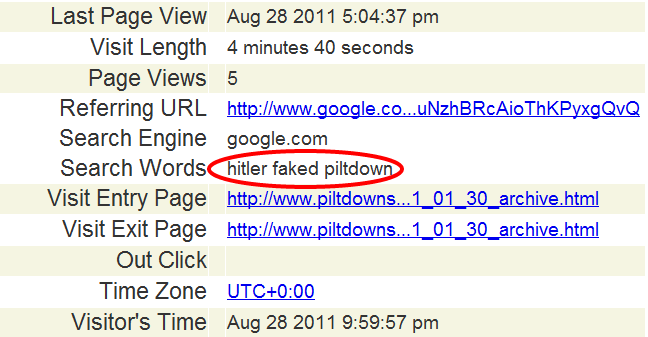 At any rate, this one from my Piltdown Superman site is too baffling to leave alone. 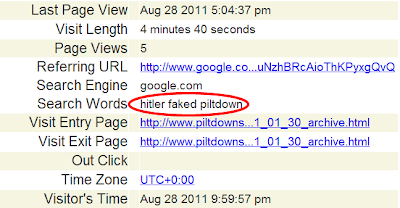 I hope someone didn't think that it was even possible for Hitler to fake Piltdown Man. He was born in 1889 and the hoax began in 1912 in Piltdown, East Sussex. World War I began in 1914, and Hitler was a minor soldier in that war. He did not rise to power in Germany until 1933. So, what was Hitler doing in England, planting a fake evolutionary ancestor (never mind that the real culprits are known) twenty one years before he rose to power? Well, let's not let the facts mess up a good conspiracy theory. It could be fun, capice? The Dishonest Claim that Atheists "Lack Belief"
Buon giorno. One of the apologetics podcasts that I listen to is Greg Koukl on "Stand to Reason". He is yet another former atheist turned apologist for the Christian faith. He has a radio show, and gives monologues as well as receives calls from Christians, atheists and other people.